Walking with Jesus: Day 20: Acts 7:44-53 & Prov. 9:13-18 - What Was God's Purpose for the Tabernacle and the Temple? Day 20: Acts 7:44-53 & Prov. 9:13-18 - What Was God's Purpose for the Tabernacle and the Temple? What Was God's Purpose for the Tabernacle and the Temple? 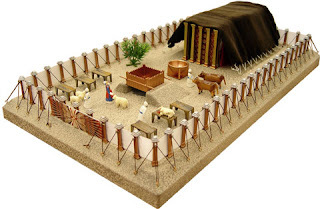 As he nears the end of his sermon before the Sanhedrin, Stephen tightens his focus on the Tabernacle and the Temple. He was accused of speaking against the Temple, but as a believer in the Lord Jesus, Stephen knows the true purpose for the Tabernacle and the Temple. Moses made the tent of witness (the Tabernacle) according to the pattern God had shown him. Later, the Temple was constructed by Solomon following the same pattern. These places were given by God to instruct His people about the right way to worship Him and to show them their need for forgiveness and intercession. Stephen was quoting the prophet Isaiah. The Lord was confronting His people through Isaiah for a pattern of nationalist arrogance that saw the Temple as the guarantee of God's absolute favor and protection of the nation of Israel. God's people thought God had given them some guarantee of His protection and that they could claim exclusive ownership of the presence of God. But that was never the purpose of the Temple. Jesus had connected the Temple to Himself when He said, "If you tear down this Temple, I will raise it up in three days." (John 2:19) By "this Temple," He meant the Temple of His body. Standing in the Temple courts and speaking about the destruction of His body in His coming death on the cross, Jesus was teaching His disciples the real meaning of the Temple. Temple worship was given to teach God's people that they were sinful and that only a perfect sacrifice could take away sins. They were taught that they needed to be cleansed in order to approach a Holy God. They were taught that they needed a priest to represent them before God. All of these truths were pointing them to Jesus- the perfect sacrifice, the cleansing, and the Great High Priest we truly need. Stephen condemns the Sanhedrin as "stiff-necked people, uncircumcised in heart and ears [who] always resist the Holy Spirit" for one simple and powerful reason: They care more about the Temple building itself than about the One who came to fulfill the meaning of the Temple in His own body. 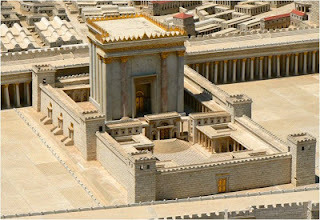 They claim to love God's Temple, but they killed God's Son who was the fulfillment of the Temple. We need to be careful that we don't become so focused on the performance of religious duties that we forget the object of our worship and the author of our faith, Jesus Christ. Like the Israelites, we can easily miss the whole point of worship if we focus on the superficial and miss the Gospel. Heavenly Father, Thank You for the gift of Your Son. He is the true and living Temple. In Him, we are being built up into a living Temple where You will dwell forever. We are Your house and Jesus is the Great High Priest over Your house. Give us Your Spirit that we may worship You rightly, now and always. In Jesus' name, Amen. surrounding us in our culture daily. Give us the grace to listen to Your wisdom and never to Folly. that no one will ever know if we lie and scheme to get what we want. But we are always living our lives befire You. The voice of Folly leads only to death. Keep us in Your Son and His wisdom, our true life.